The latest effort from the Spin Doctors, Turn It Upside Down, provides a mixture of songs covering ground already tread on their first album, along with some fresh material. 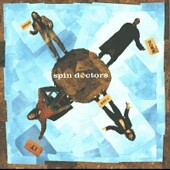 While this one starts out with "second-album" syndrome, it quickly moves on to some new and different material and is a must for Spin Doctors fans. Big Fat Funky Booty, while providing a nice kick to start off Turn It Upside Down, is a virtual remake of What Time is It?. Similarly, You Let Your Heart Go Too Fast is a total remake of Little Miss Can't Be Wrong. As Turn It Upside Down progresses, the newer material begins to surface and shine. Cleopatra's Cat is a funky song that allows vocalist Chris Barron to play off the whining guitar of Eric Schenkman. Indifference gives Schenkman a chance to cover the vocals and play a short but sweet acoustic guitar solo. Turn It Upside Down is available from Barnes & Noble.